Twenty five years after the fall of the Berlin Wall, views of East and West Germans are not seamless, but on the most basic of questions – life satisfaction – residents of the former German Democratic Republic express as much happiness with their lives as do West Germans. That is far different than the way things were back in the days immediately following the collapse of communism. In 1991, a Times Mirror Center survey found only 15% of East Germans expressing a high level of satisfaction with their lives, compared with 52% of Western Germans. More than two decades later the happiness gap has disappeared in Germany. Nearly equal sized majorities in both regions of Germany are highly satisfied with their lives – 61% in the West and 59% in the East, according to the Pew Research Center’s Spring 2014 global survey. Large improvements in public contentment are also apparent in other former communist countries. Satisfaction jumped from 12% in Poland in 1991 to 38% today and from 6% to 43% in Russia. Happiness was also on the rise in Ukraine after the fall of the Soviet Union, increasing from just 6% who expressed a high level of satisfaction in 1991 to 32% in 2007. However, recent problems there have taken a toll and just 23% of Ukrainians now say they are happy with their lives. 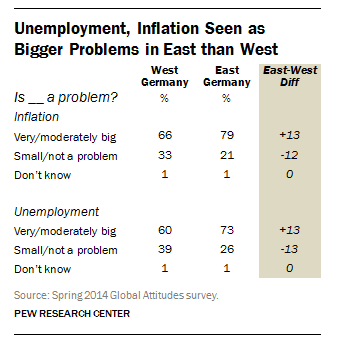 Recent Pew Research surveys do indeed find a greater percentage of the residents of the former GDR concerned about inflation and unemployment than in West Germany. However, in other regards, the residents of the “two Germanys” are not so different. They have similar views as to whether their children will be better off financially in the future than they have been. And there is little regional difference in views about the national economic situation or one’s personal economic well-being. Perhaps most significantly, given the ideological history of the two regions, there is not a gap in perceptions as to whether inequality is a problem in Germany today.